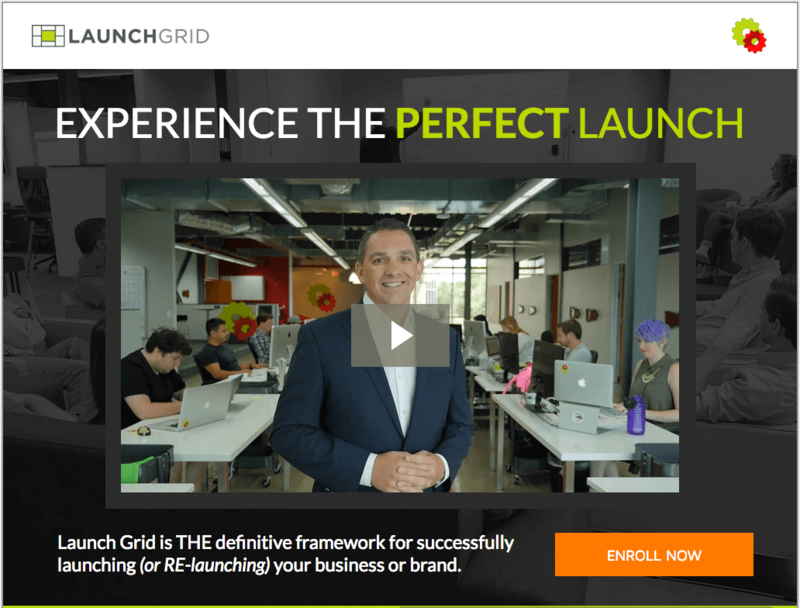 WHAT IS THE LAUNCH GRID WORKSHOP? Launches don’t have to be risky. During the Launch Grid workshop, you’ll soft launch your idea and find out if your market wants what you’re selling before you spend a lot of money on advertising, or waste a lot of time on product creation. Knowing who should serve is one thing… FINDING THEM is an entirely different challenge. During the Launch Grid workshop, you’ll not only identify your ideal customer, you’ll also locate them, and build perfectly scripted “Awareness Campaigns” that get your brand noticed…even if you’re unknown, today. Do you know exactly what you should say on your home page? What about your ads, and emails, and landing pages? What about your “elevator pitch?” You don’t have to guess. 5. Getting Your First Sale…And Beyond! Launch Grid is NOT a formula that produces “One Hit Wonders.” During this workshop, you’ll craft a “Predictable Selling System” that will get you your first, PROFITABLE sale. But it won’t stop there. Once your “Predictable Selling System” has been tested in the marketplace, it can easily be scaled into more and more sales, making Launch Grid a framework for business growth…not merely product launches. In part 2, we’ll soft launch your new offer and test for market fit. 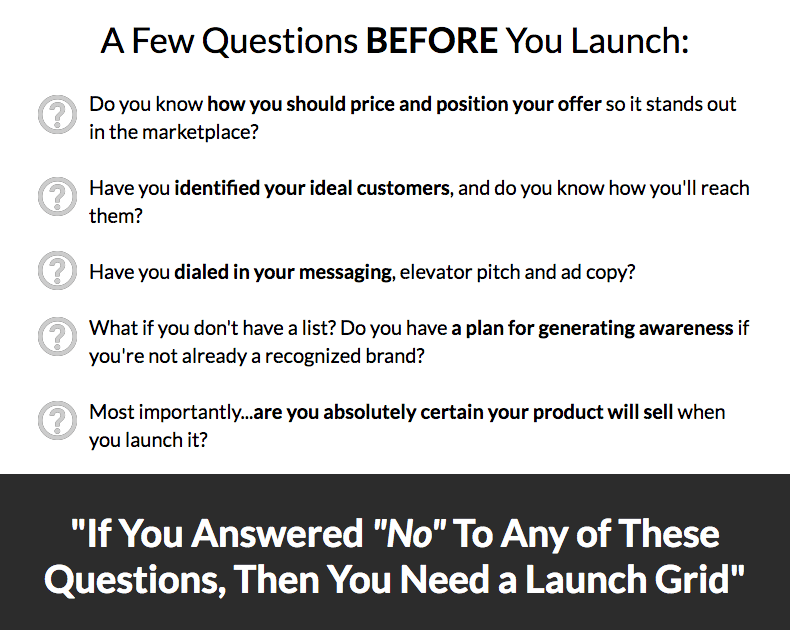 Well utilize risk-free and cost-free methods to “soft launch” your offer, so you can test your idea before you even build your product. PART 3 – You Will LAUNCH! In part 3: You. Will. Launch. You’ll set a date, you’ll activate your pre-built “Awareness Campaigns”and you’ll allow your pre-tested “Predictable Selling Systems” to convert total strangers into rabid buyers and raving fans. Once you’ve proven that your “Awareness Campaigns” and “Predictable Selling Systems” are working as planned, the next step is to architect the post-sale process that will simultaneously decrease refunds and churn, and increase customer values and overall satisfaction. Don’t ignore this step…it’s critical! Module 6: Getting Your First Sale…And Beyond! At this point, all your assets are in place and your systems and assumptions are fully tested and validated. It’s launch time! In this module, you’ll set your launch date, and YOU. WILL. LAUNCH. And then…YOU. WILL SCALE. Get ready, because things are about to get very interesting (in a very good way).